Dr. Kpakpundu Ezeze, Ed.D., is the founder of Future Quest Inc., a consulting firm that specializes in educational planning and college placement. He has been a guidance counselor, assistant dean at the University of Pennsylvania, an admissions associate at Harvard University and the associate director of the Advanced Placement program at Educational Testing Service. He has written for the Journal of College Admissions and Newsweek. Dr. Ezeze lives in Washington, DC. The quest for admission into a top college is an exciting journey! Dream College presents a clear roadmap to this destination. 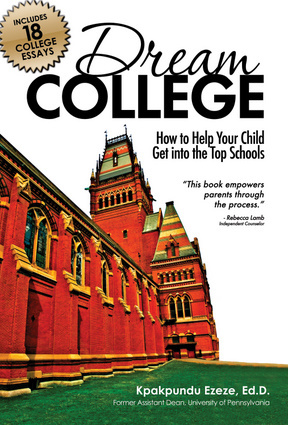 This book synthesizes Dr. Ezeze's three decades of academic advising into a user-friendly guide, detailing the path from high school, to selecting the right colleges, to the application process, to thriving as an undergraduate. Writing tips demystify the college admission essay, offering step-by-step guidance from prewriting to revision. Plus 18 real admission essays are fully analyzed. Calendars, checklists, self-evaluation tools and scholarship resources enable students and parents to chart a purposeful course. Financial aid resources detail need-based and merit-based scholarships from federal, state and local programs, in addition to private monies from colleges, universities and the corporate sector. Individual chapters speak directly to students of color, athletes, special-needs learners and first-generation college bound.